I suppose I must have a dark sense of humor indeed to think of the Coen Brothers’ film Fargo as a comedy – even if I do realize that it is a dark comedy. I mean, what can you say about someone who shrieks, then laughs uproariously, at the woodchipper scene? Yes, Fargo is a weird and dark tale – from William H. Macy as Jerry Lundegaard, the pathetic car dealership manager who pays two sleazy criminals to kidnap his wife, to Steve Buscemi as the “funny-looking guy” in that criminal pair, from Frances McDormand as Marge Gunderson, a pregnant police detective, to Steve Park as Mike Yanagita, the high school classmate who visits her in one of the film’s many bizarre scenes. All of the actors in the movie are outstanding, but my favorite by far is McDormand, who also happens to be married to Joel Coen and who acts in a number of the Coen Brothers’ films. Apparently, I am not alone in my assessment of McDormand’s portrayal of Marge Gunderson, as she won a Best Oscar Actress for this role. But as it turns out, the story may not actually be true – or then again, it may be. The Coen Brothers have both asserted that it is true and laughed off questions about its veracity. As Ethan Coen says, “You don’t have to have a true story to make a true story movie.” Learn more about the truth or fiction of Fargo by visiting Snopes, the Huffington Post, and Film School Rejects. Now if you haven’t seen Fargo, I don’t want to give anything away. Suffice it to say, watching Fargo won’t be your average viewing experience. And as you watch events unfold, you may be thinking, “She finds this funny? !” As I said, it’s a dark sense of humor that draws me to this film. Fans of the Coen Brothers’ other films will know what I mean. From one of their earliest films, Raising Arizona , Joel and Ethan Coen have shown themselves to find humor in the strangest of settings. I know people who are such ardent fans of Raising Arizona that they can recite virtually every line, and that is even more the case with their cult classic The Big Lebowski (anyone for a White Russian?). Probably their “biggest” film to date is O Brother, Where Art Thou? It stars George Clooney as a modern-day Ulysses on an odyssey through the Depression-era South. Of course, laughs are once again in big supply. To dig deeper into Fargo, check out The Atlantic’s in-depth consideration of the film that “brought it all together” for the Coen Brothers. You can watch a television interview with the Coen Brothers and Frances McDormand about Fargo, and you’ll also enjoy a short video about the seven things you probably didn’t know about Fargo. A great deal of dialogue from the film can be found at Wikiquote. To go all scholarly on the film, check out The Coen Brothers’ Fargo , a Cambridge Film Handbook. To think more fully about the Coen Brothers’ long career in filmmaking, read The New Yorker’s assessment of their work. A three-minute video tribute to their many films is also available. You might also find it interesting to read Ian Nathan’s new book, The Coen Brothers: The Iconic Filmmakers and Their Work , or Mark T. Conard’s book The Philosophy of the Coen Brothers . Also useful is a collection of interviews with the Coen Brothers. Of course, Fargo was so successful that it spawned a TV spin-off twenty years later! There are mixed reports about whether the Coen Brothers like the television series, but for my money, the original film is all you need. If you want to add Fargo to your DVD collection, consider buying Coen Brothers Collection , which includes Blood Simple, Fargo, Miller’s Crossing, and Raising Arizona. Or you might just want to stick with the special edition DVD of Fargo. However you watch Fargo, just be sure to laugh. It’s not all grim and macabre – at least not to me! 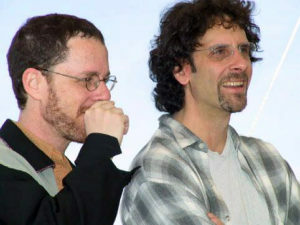 Image Credit: Ethan and Joel Coen at the Cannes Film Festival in 2001. Used with permission, https://commons.wikimedia.org/wiki/File:COEN_Brothers_(cannesPH).jpg.